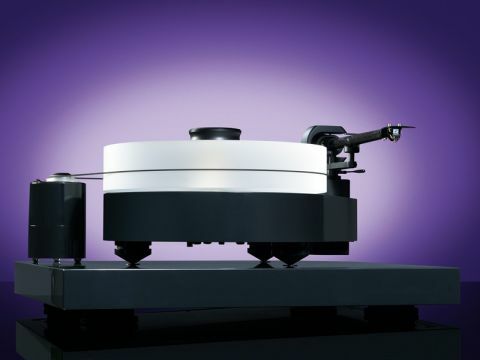 There are two types of turntable: suspended subchassis and high-mass; Pro-Ject has combined the two! Pro-Ject's founder Heinz Lichtenegger is no longer satisfied with just cornering the budget market, he's now set his sites on the turntable high end and his latest weapon, the RPM10.1, is a substantial and shiny beast. Heinz is a classical music lover and this turntable directly addresses one of the key issues with such music on vinyl: trackability. The RPM10.1 comes with not one, but four alternative counterweights, which are supplied so that the arm/cartridge resonance can be kept totally under control in order that the system can track anything you throw at it. Pro-Ject has also produced a test disc and by combining the two you can establish which counterweight gives the best tracking and thus the least distortion. The canon in Tchaikovsky's 1812 Overture requires the highest stylus acceleration on record at 90μm – a rate with which most moving coils struggle to cope, yet Pro-Ject's engineers have managed to get an MC to track its test disc at 100μm. Lichtenegger is quick to point out, though, that there is more to a great turntable and arm combination than theoretical tracking ability. He appreciates that setting up turntables well requires more than a test disc, but is clearly aiming to bring a little bit of science into the process. The RPM10.1 is a revision of the RPM10, but quite a significant one. There are two key differences: one in the base, or Ground It Deluxe 3 (which is the rectangular slab that supports everything) and the other in the tonearm. The Ground It incorporates magnetic decoupling through its four adjustable feet and provides a literal physical ground on account of its 13.4 kilogram mass. The 10cc version of the Evolution arm has had a lot of attention applied to controlling resonance and Pro-Ject has used more carbon fibre in a tighter weave than the previous incarnation. It has also incorporated Sorbothane damping in the four counterweights, each of which covers a range of cartridge weights ie: 4-6g, 5-8g etc, but there is some overlap between them. In other respects this 10-inch arm is made of a single piece of carbon fibre with a conical shape, in order to combat standing waves. The bearing is an inverted type that uses ABEC7 ball races in a substantial ring-shaped housing for maximum rigidity. You can adjust armbase height in order to vary VTA and the armtube can be rotated so that azimuth can be changed. As with most Pro-Ject tonearms, the arm wiring is terminated in a pair of RCA phono sockets, so that alternative cables can be used to connect with the amplifier. The rest of the RPM10.1 is hardly less substantial than the Ground It, the plinth is made of 63mm-thick MDF, with the same dark-grey gloss finish as the base. It sits on three sorbothane-damped aluminium cones and incorporates the armbase and a magnetically supporting inverted bearing for the platter. This part is 60mm-thick and made of acrylic, but is described as 'a sandwich construction' which seems odd as it's clearly one-piece, albeit one five-kilo-plus piece that's topped off by a brass record puck. The motor is effectively freestanding and sits atop a piece of metal of the same diameter and finish. Pro-Ject supplies a spacer device so that it can be placed the correct distance from the platter and connected by a thin square-section rubber belt. On/off switching is atop the motor and speed-change a case of switching pulleys. The pictures do not lie: this is a superbly finished turntable with plenty of attention to detail and the tonearm is particularly inspiring, thanks to the chunky bearing housing, although the thread and weight anti-skate system seems a shade old-school these days. There's no doubt that Pro-Ject offers excellent value for money in its turntables and this is just as apparent here, as it is with its budget models. Next to the Well Tempered Simplex, it looks twice the price, but as we know great record players are about more than scale and finish. Our current favourite in this price range is the Michell Gyro SE, which is equally impressive for the level of sheer engineering it delivers. But high-mass designs are always more expensive than conventional ones. This price sector is becoming one of the most hotly contested, with a number of established designs being available with and without a tonearm. From the Gyro SE (£1,450) including a TecnoArm to the Townshend Rock 7 sans arm and Well Tempered's relative newcomer the £1,495 Simplex with its damped golf-ball arm bearing. The latter two have a technological advantage, while the Gyro SE is a well executed suspended design at a great price. The RPM10.1 on the other hand offers good isolation, thanks to its Ground It base and combines a truly evolved tonearm with a range of counterweights that offer a real advantage in resonance control. All that mass in the platter confers a certain stability to the sound of this turntable; we fitted a van den Hul Frog LO moving coil into its carbon-fibre arm and used the supplied interconnects to connect it with a Trichord Dino+ phono stage and got a smile-inducing result. Tom Waits picked a very fine band for the album Swordfishtrombones and this turntable certainly brings out the quality of the recording, with plenty of acoustic around the percussion and double bass. The tiny fingerlift is a bit tricky to drop into inner grooves, but the lift/lower device can be used for this purpose, while the arm is notably microphonic when you move and dock it in the clamp. This is not a problem while playing, however, and where resonances are higher, this is not necessarily a bad sign. There is very little sense of the 'halo effect' that can challenge acrylic platters because of the deck's mass and clamp and while it's not the most luxurious-sounding turntable around, it's pretty damn smooth – capable of delivering weighty, tuneful bass which helps to create good image depth. In fact, the bass can be sumptuous when the record delivers the goods. Rickie Lee Jones' Flying Cowboys does it with a chewy bass guitar beneath and a crisp high-hat up top, while another track reveals superb string tone above a beautifully timed bottom end. This is a classy turntable no doubt about it. We investigated the benefits of the Ground It base by using the turntable both with and without a Custom Design stand. It certainly proved its worth by allowing the RPM10.1 to deliver a considerably more open sound that lifts and separates in true 'cross your heart' style. The bass gets a lot more room to breathe in and you can hear distinctly more fine detail across the range. With its comprehensive approach to cartridge set-up and the efforts put into keeping resonance at bay with the Ground It base, this Pro-Ject is clearly a sophisticated beast. A state of affairs that's reflected in a resolute and engaging sound. Whether it would better our recent Blind-listening Group Test winner, the Michell Gyro SE, is hard to tell. It doesn't have the pace of a Well Tempered or the solidity of the Rock 7, but it does have a certain finesse and calm resolution that is very enticing. Thanks to good dynamics and timing, not to mention excellent separation of detail – it needs to be auditioned.